Wow, it's that time again! I have to admit, this is only the 2nd time I've managed to get my act together enough to do one of these postings, I know there are a lot of people who post on this, so I'll try to keep things brief and let the pics speak for themselves :-) Above is Salvia 'Black and Blue', which continue to look great until they are cut down by frost (which in Portland, might not happen until after Christmas). I really like this patch of 'Black and Blue' the most, as it's backed by the Miscanthus (I think Malepartus, but it wasn't labeled, if anyone can tell for sure, I'd appreciate it!) which in Autumn turns bright, blazing yellow and really sets off the Salvia nicely. The blue is electric against the yellow. 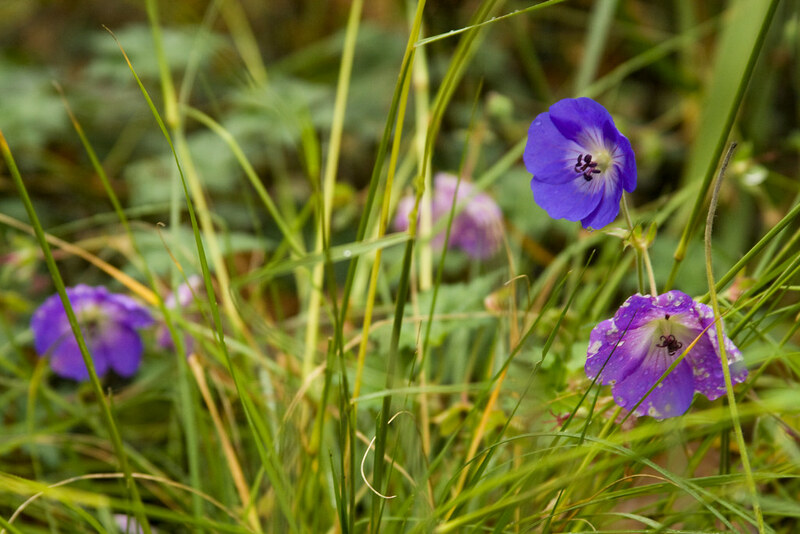 In spite of it's fragile stems which constantly snap, 'Purple Majesty' continues to put on its show. Like its relative above, it is really at it's best in the fall, and will keep pumping out these blooms until frost. 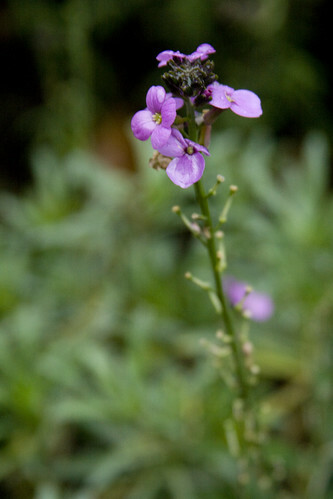 The Erysimum are entering their season, they have started to bloom again, albeit lightly, but the fact that they are evergreen makes them doubly valuable. 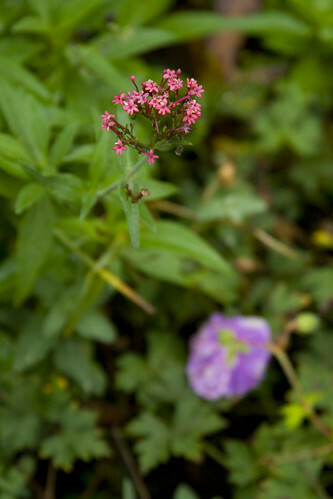 The Centranthus are still blooming, although only a few scattered blossoms here and there. They have started to bulk up at the base and I'm noticed numerous seedlings in their vicinity that seem suspiciously like the work of self-sowing...not that I'm complaining, I'm moving the Rodgersias that are there currently to a more shaded position next spring, and these will fill in their vacant spot. Poor 'Ann' has unfortunately been reduced to mere stems by the ravaging slugs, but bravely, she still manages to throw up a few blossoms. I've been spreading slug repellant continuously for the last week or so, but to no avail, they REALLY want to eat my plants. Strangely, they seem to ignore some geraniums in favor of others. 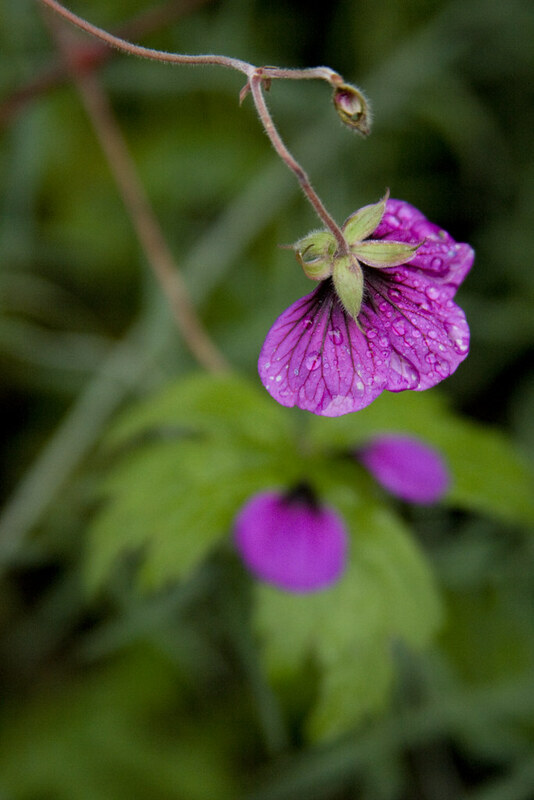 They love 'Ann' and 'Walters Gift' but seem to not bother 'Rozanne' or my Geranium macrorhizum...strange. In spite of the fact that it is the floppiest and messiest plant in my garden, this Agastache is also one of the most vigorous and longest blooming. It started in June and is STILL flowering, though not heavily. Next year, I'm moving them all to the sunniest position I can find...and even then, will probably pre-emtively truss them up to keep them from smothering their neighbors again. 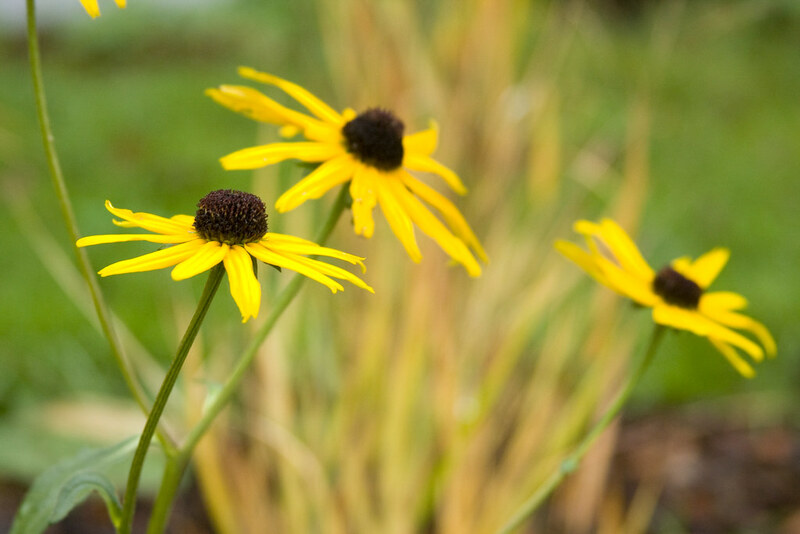 The lovely Helenium continues to toss up the occasional blossom, making it another winner for long-season bloom. They may be floppy and somewhat prone to collapse, but they are so care-free and floriferous, I'll keep growing them happily! I can never quite tell the moment when the Sedum stop actually flowering and just enter their 'seedy' phase. It doesn't really matter, they are lovely in all stages of their blooms. My wondrous 'Red Dragon' keep throwing up sprays of dainty, white flowers, which, while not extremely showy, have a delicate charm that I find endearing. 'Red Dragon' is one of the plants that seems to really hit its stride right now, while other plants are slowing down or going to sleep, it's like a crazy club kid, it just keep growing! Agastache 'Acapulco Orange' has been a real trooper this year, and is still blooming lightly, but sporadically. I can't remember which Origanum this one is, but it's flowers and colorful bracts continue to add a subtle beauty to the garden. The superstar of the garden, 'Rozanne' just keeps going and going. It's foliage is starting to look slightly tattered, but compared to so many other plants, it's fresh as a daisy. It continues to bloom and bloom, not as heavily as in the summer, but any flower is welcome. Here it is pictured with one of the Amsonias I planted this spring. 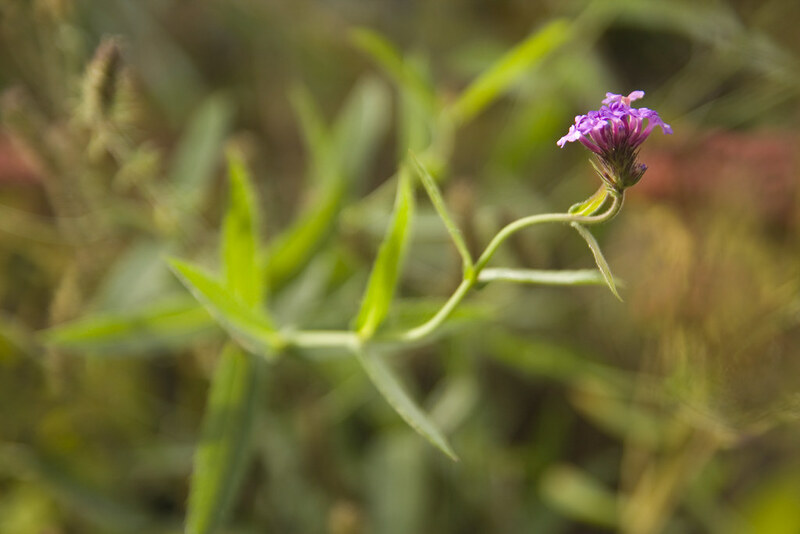 This Verbena is really late to emerge in the spring, and I honestly thought it had died over the winter. 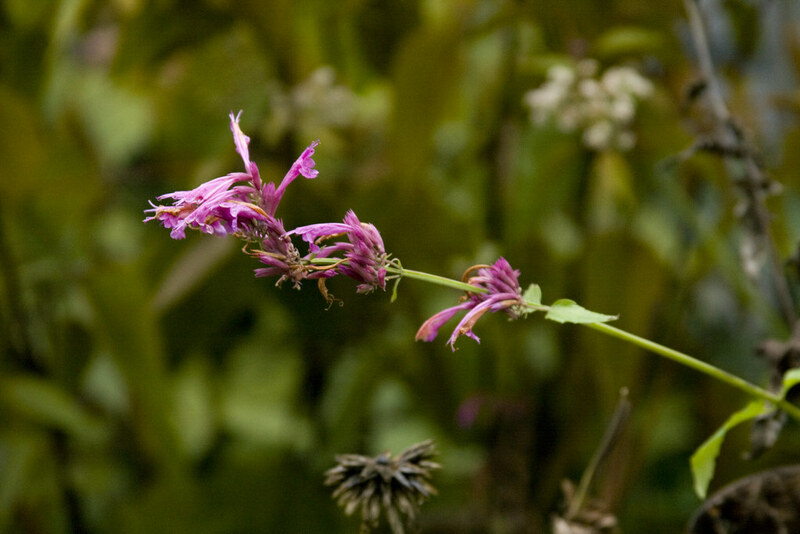 However, once it pops up, it grows at amazing speed and is a great filler throughout the garden, issuing its lovely pink-purple blooms all summer and fall until the first frost. A true superstar, my poor Rudbecia triloba pretty much collapsed on itself earlier this month, under the burden of heavy rains and its blooms. 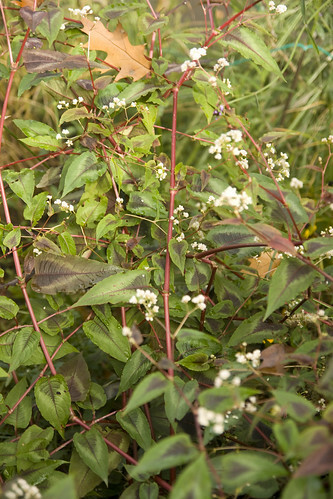 Lovely Persicaria, just keeps growing and blooming, slugs keep attacking it, and it keeps growing new leaves. I love this plant. This lovely Joe Pye relative is grown primarily for it's wonderful dark foliage, which looks amazing all spring and summer. Right about the time it blooms, most of the leaves of mine are pretty much green with a dark tinting. Even so, the flowers are lovely, white and frothy. Another plant that just keeps blooming and blooming. I don't think its stopped once since I planted it in July...just amazing! Ok, yeah, it's barely blooming, but hey, I'm going to eek out whatever I can this month! One of my favorite grasses, in spite of it ubiquity in shopping center parking lot plantings. 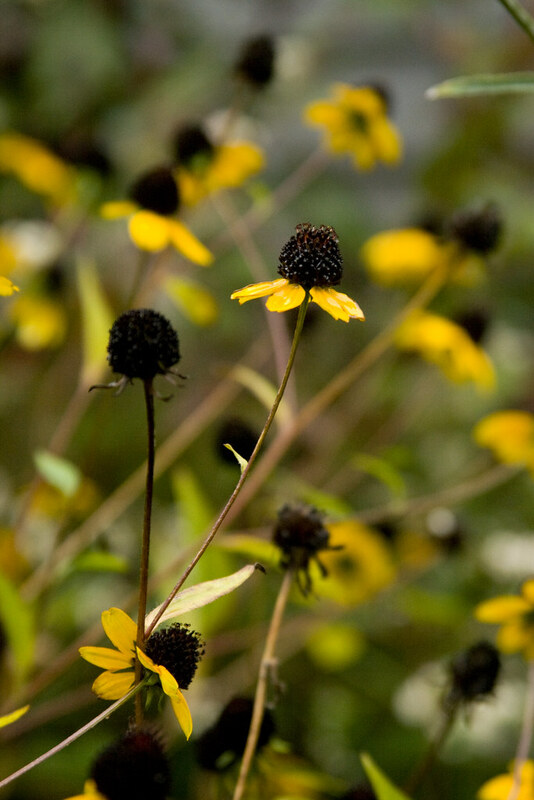 I love it's fuzzy flowers and the lovely, buttery shade of yellow it turns in the fall. The Checker Mallow I got this spring at a native plant sale. It's pretty small still, but has been blooming lightly for months, I'm interested to see what it will do next year. Strangely, while most Rudbeckia seemed to be done months ago, including those on the other side of my house, these are still blooming, and quite vigorously, in spite of the constant onslaught of slug attacks. What a wonderful corner garden you have. 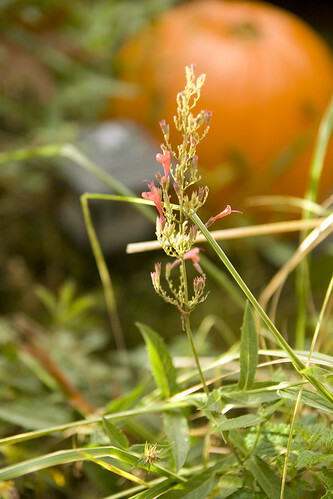 I am amazed at all of the blooms your still have in your beds.Your grasses add so much to your Fall garden too. Have a wonderful week! Scott, You've got so many of my favorites here, both the ones I grow and the ones I've killed and/or can't grow, like persicaria 'Red Dragon' R.I.P., and wallflowers, not hardy here. I like especially the first photo with the golden background! I so much enjoyed your blooms and photographs. 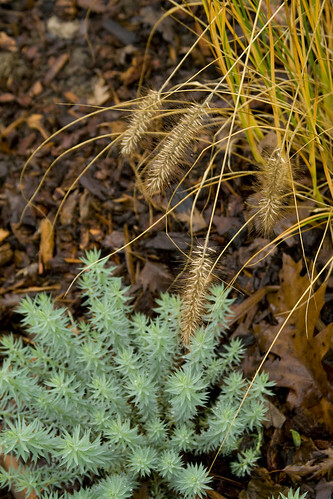 The grasses are such a great addition to any fall garden and the pink seed heads are really pretty. 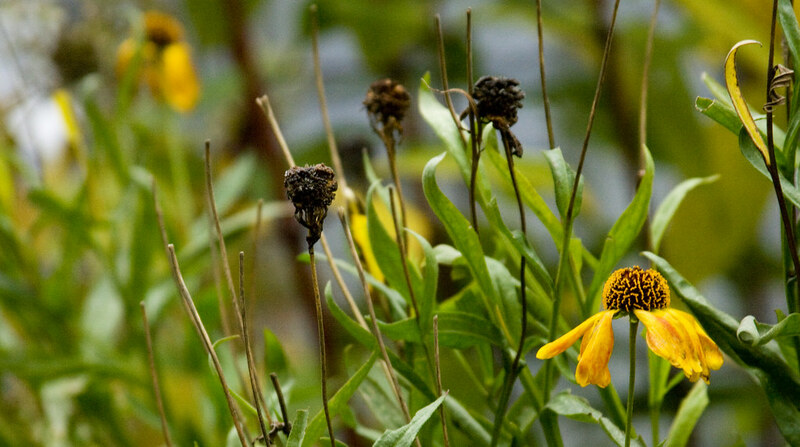 The Rudbeckia still has flowers, all of mine is gone to seed and cut back. Cool photos, Scott. Glad you got your act together for this GBBD. Great pictures. That first is luscious. My Black and Blue succumbed to the frost recently. It really is best close up. Lots in bloom and don't sweat it if you miss a month. It should be fun and not stressful. Hey, thanks for swinging by my site earlier. I'm going to do a post tomorrow about using bulbs as holiday gifts, so you may not want to plant all of yours in the ground. It's so nice to have fresh flowers inside when it's cold and dreary outside. In my humble opinion anyway. I'm a little jealous of your gorgeous garden! Your garden looks gorgeous. 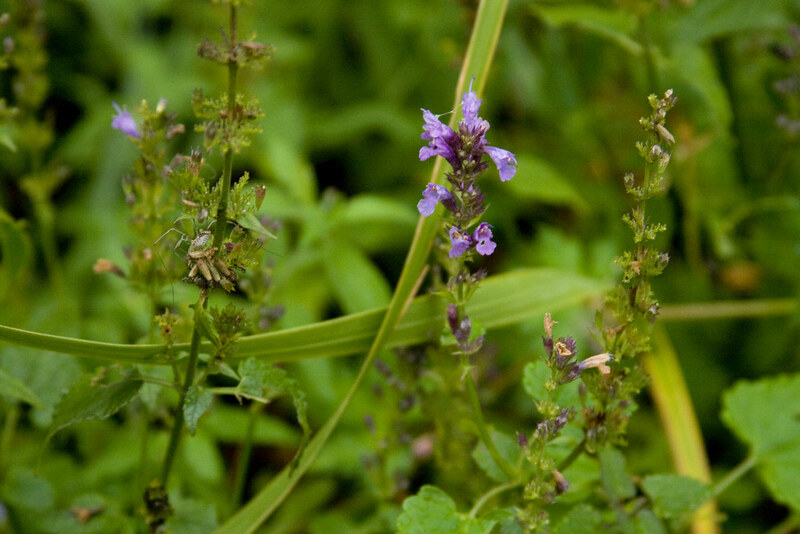 Interestingly, I have some of the same salvias and agastaches in my garden in Southeast Texas and they are thriving here, too, in a very different climate from yours. Nice collection of blossoms! 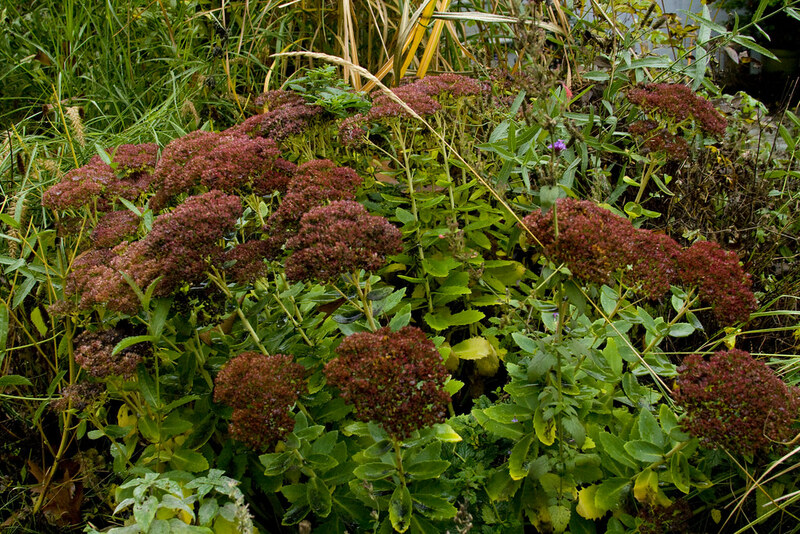 Seeing your Sedum reminds me that I totally overlooked mine (although yours looks tons better then mine). Funny, I was determined to get a photo of every single bloom and I totally spaced them. Must have walked by them at least twice. Kudos to your powers of observation. What beautiful photos you have! I love your geranium 'Ann Folkard', rudbeckia and pennisetum photos especially! 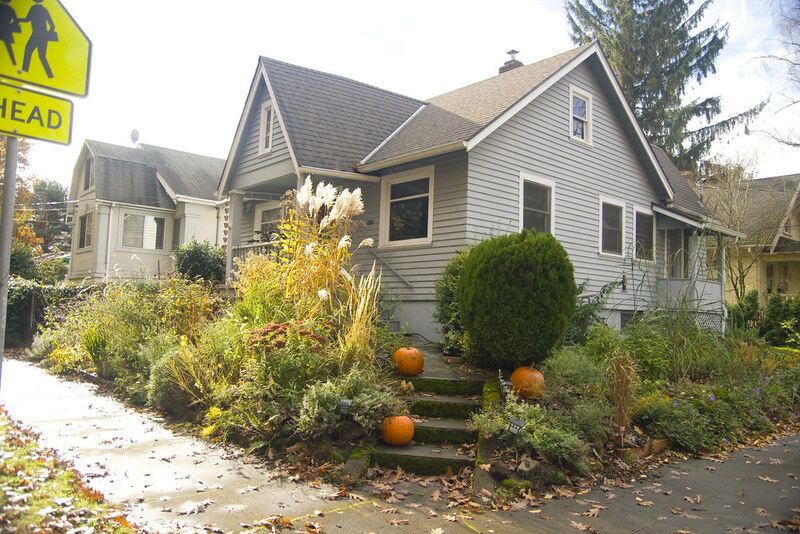 Your garden, to me, is what fall should look like. Thanks for posting! Wow you still have a lot blooming. 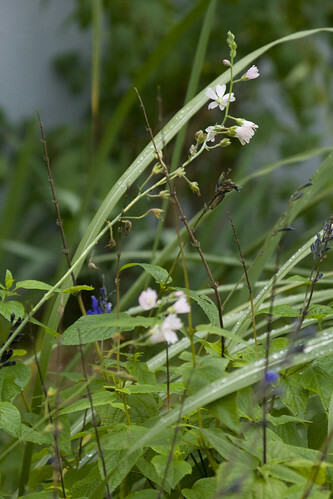 I have 'Rozanne' and Centranthus flowering here still too, but Agastaches and Salvias are done. Are your frosts really that much behind ours? We still haven't had one, but I'm sure we will in the next couple of weeks. Yeah, any of Nan Ondra's combos are totally worth stealing. She has a great eye. I'm insanely jealous of your ability to grow amsonia. I never see it in Austin--too hot for it, I suppose. That first shot, with the orange background for the salvia, is a beauty. Great photos. I love the first one, the blue against the gold is gorgeous. Lovely close-ups. Your house is lovely too. Still a lot of flowers blooming in your garden Scott. Great micro shots of them too! Wow, you have some truly stunning plants still blooming away in your garden, and some lovely combinations. Knautia macedonica is a favourite of mine too, but I envy you the salvias, I have the wrong soil for them to thrive. I think I'd be tempted to stick to the slug-resistant geraniums and spare myself the pain! Thanks for stopping by my blog. Wow - there are a lot of blooms lingering in your garden! 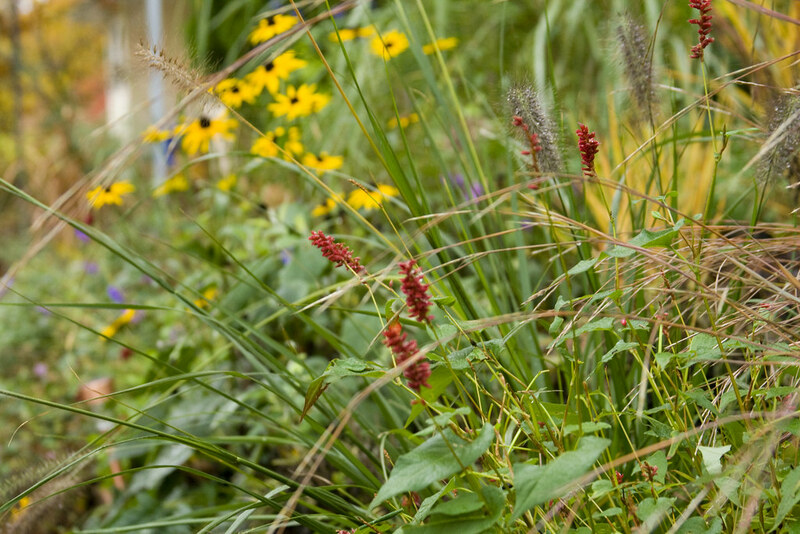 I've never seen that purple S. guaranitica before and I love that little red persicaria too... So many good ideas here... Thanks too for showing the long view of your gorgeous garden! Great pictures. I've been seeing Amsonia all over the web this fall but barely heard of it this summer. I think I need to get some! Great pictures, Scott! I see that things are still hanging on to their blossoms for you in Portland. 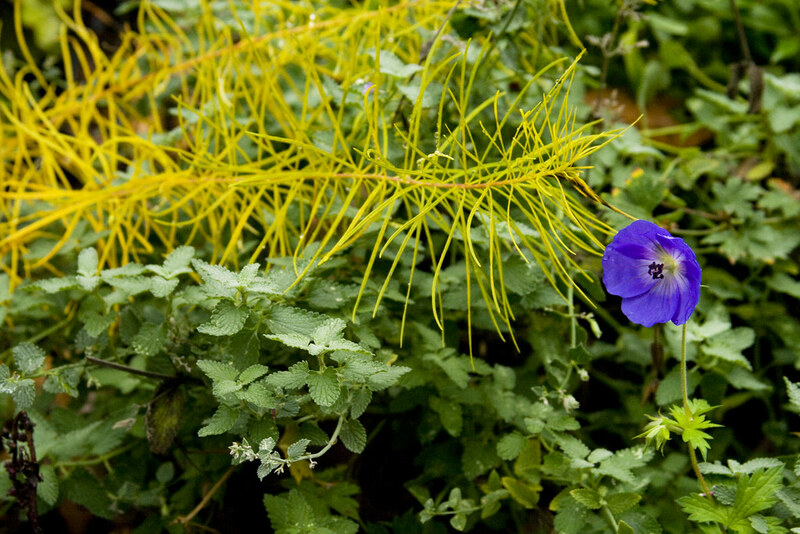 I like the picture with the geranium 'Rozanne' and the Amsonia hubrechtii together. Happy Gardening! We grow a number of the same plants. Tell me, how long have you been growing centrathus ruber? I have just put that one in my garden and am wondering how weedy it may become. Love the salvias and the geraniums. Ok, I'm overwhelmed. Beautiful. 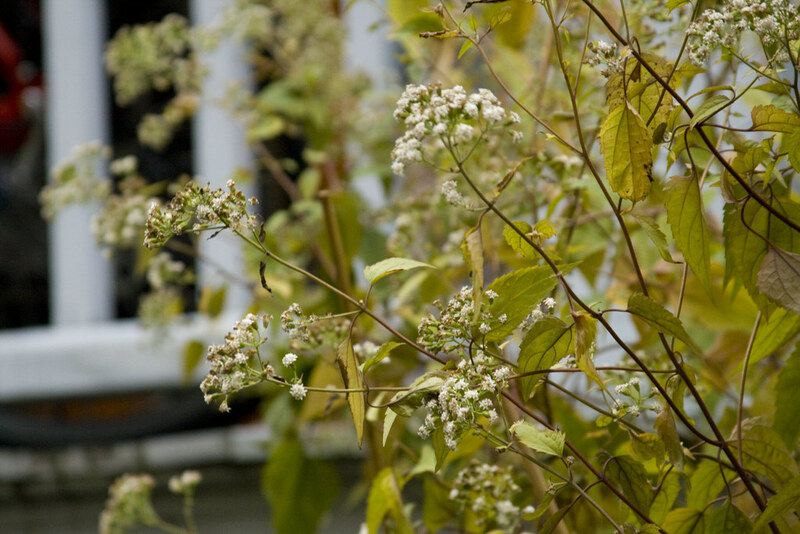 I just planted some Amsonia this fall but it is much less "feathery?" I used to have tutti frutti but it did not make it here - but jubilee did! 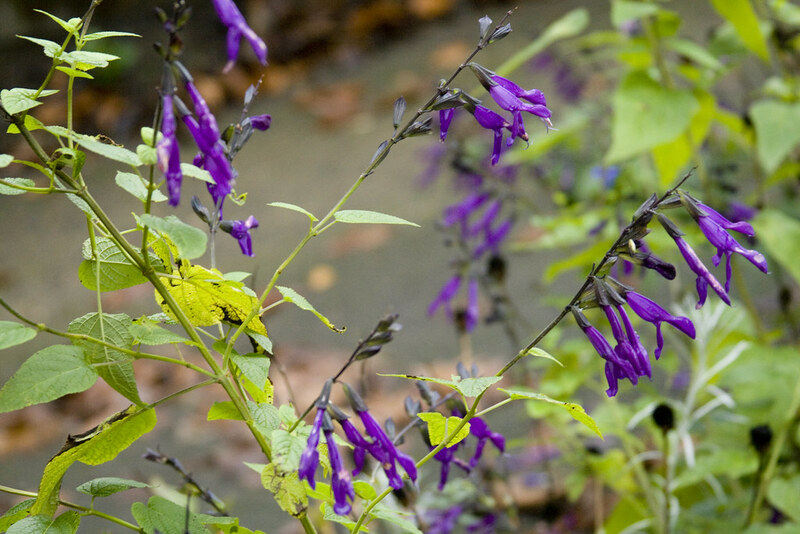 Love all the varieties of salvias and agastaches you have. 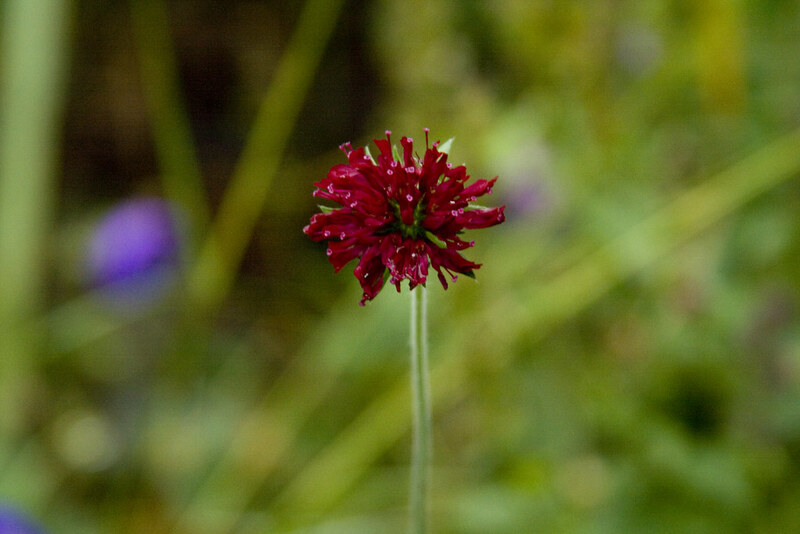 Knautia is on my list. Hopefully I can check it off soon. Had a great time touring your blooms. I see that you've got your hands full with so much space to garden. I love geraniums which I buy from nurseries in pots, but I haven't been successful in propagating them though, and we never get the blue ones like yours. Lovely colour. Wow, you have so many lovely blooms, Scott! 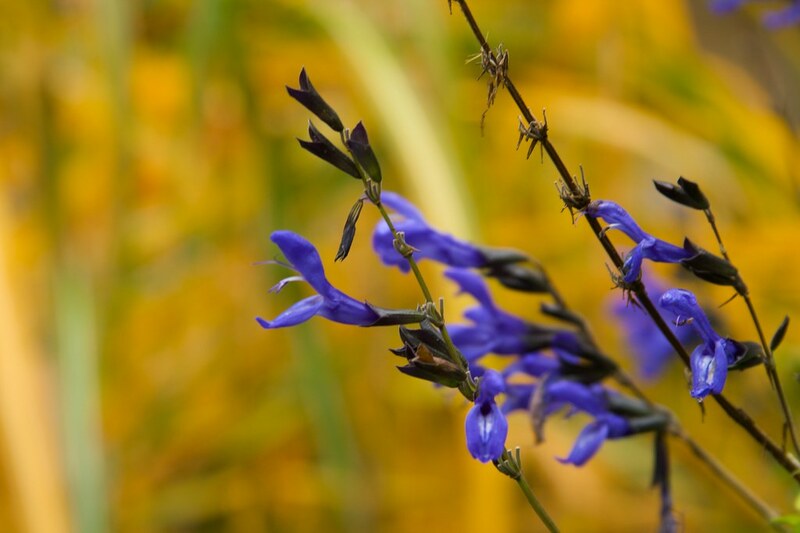 You can't beat the blue beauty of Salvia 'Black and Blue', but you certainly have a variety of blooms to compete with it. Thanks for visiting, Scott, and nice to meet you. My daughter is currently attending grad school in Portland, so I've visited her a few times. You have such a beautiful city! I love your assortment of blooms! You have enough nice looking foliage and seed heads to link in to Foliage Follow-up, too. I'm glad you included the photo of your house with the plants around it, too. I love seeing the changes with the seasons. I wouldn't mind skipping winter, and moving right into spring, though. I didn't get my knotweed seeds planted yet. I probably should do that before spring gets here. Beautiful pictures and lovely plants. That Black and Blue and the Knautia are really striking. I've never had much luck with salvias, but yours are gorgeous! Have you tried beer for your slugs? Sometimes it works for me and sometimes not, but when it does, it really does. Just a shallow container at ground level with a little beer in it does the trick. As long as you don't have any pets that get to it first! You have some very nice plants, love the combo of Amsonia and Muhly...Might try that in a few years (when the Amsonia is large enough to divide). Wish I had brought some of my Black and Blue with me from Virginia, yours is lovely. I just planted 'Tutti Fruiti', good to know it is a long bloomer. Hope mine is in enough sun. My Black and Blue is still blooming as well, however when our frost finally arrives I plan on pulling 2/3rds of it out. It has managed to eat up too much real estate. I have the Amsonia as well next to B&B, they are a nice combo at this time of year. 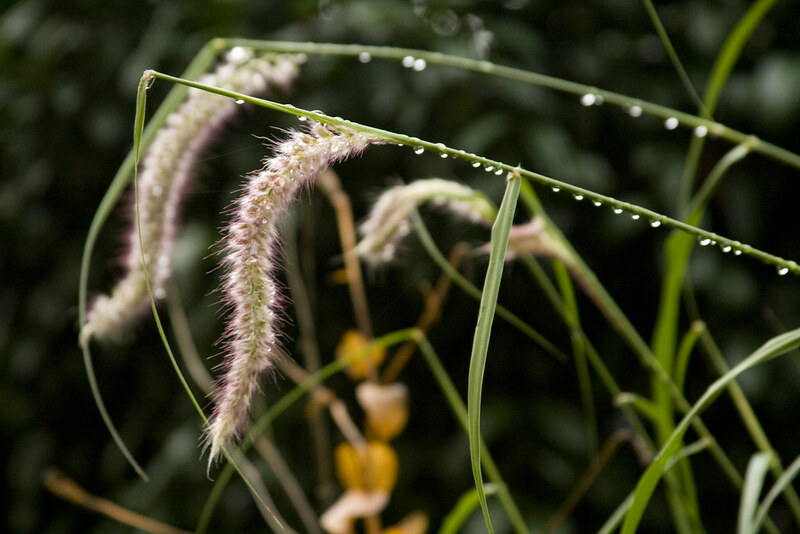 Hocking: I agree, the grasses really prove how valuable they are during this season. 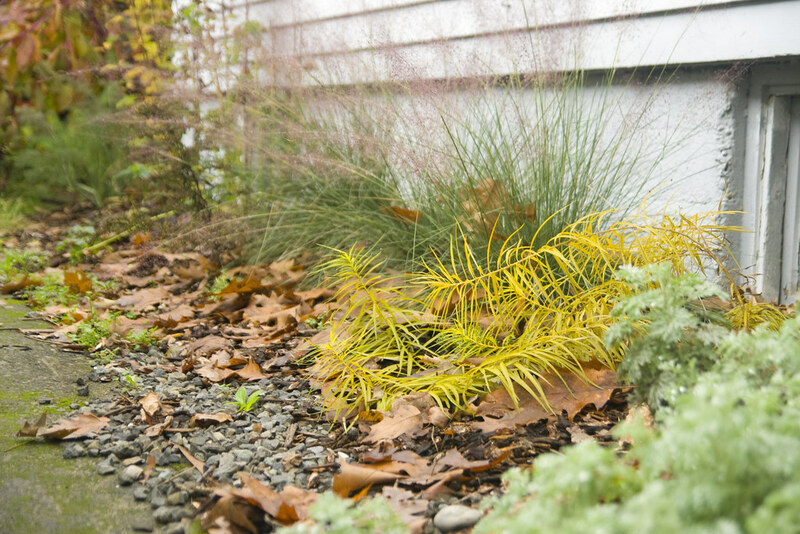 gardenwalk: Agreed, the grasses really shine during fall! Carolyn: Totally...'Rozanne' can have tons of praise heaped on it, and it deserves evert bit! Layanee: Sounds like we may get frost this weekend, so B&B may bite the dust sooner than I expected here, too. Liza: Sounds great! I'll have to swing by and check it out! Birdwoman: I guess that really goes to show how adaptable those plants really are! Pam: Thanks! I practically worship Nan Ondra...she has such an amazing eye for composition, I always think...that's such a great combo...how did I not think of it! Mac: Thanks so much...I agree...the blue/gold combo is nice...a happy accident! Janet: hahaha...you are so right, why do we gardeners do that to ourselves, we just keep trying and trying, even though we know the pain we will endure! 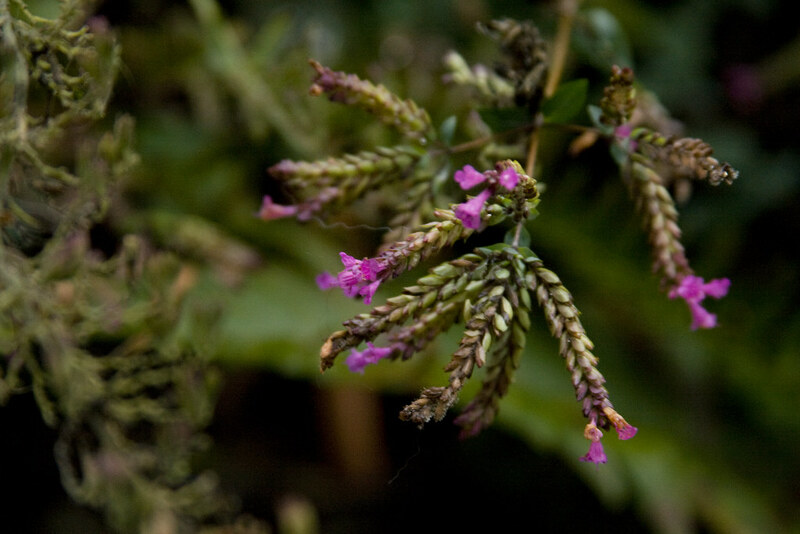 Kris: Thanks for stopping by...that Salvia is an amazing plant...the blooms are luscious...and the Persicaria is wonderful. allandrewsplants: I agree, I had never heard much about it until the last year, now you see it all over...and to think, I had to buy my plants on eBay! Thanks for the info on 'Malepartus', I'll have to keep researching that grass. Autumn Belle: Thanks so much...she's a beauty! Patty: I just planted the Centranthus this spring, after seeing it all over town. I don't know if I'd call in aggressive, but it does seem to be tough and adaptable...and does seem to seed itself around. I don't think it should become too weedy...it's always easy to pull out volunteers, once you know what they look like...but I guess we'll both find out next year, right! Violet Farm: Thanks for the compliments! I wonder if you have a different kind of Amsonia, there are a few out there, and only hubrichtii has the really fine, willowy leaves. mygardenhaven: Thanks...it is a lot of work, but I love it! I've never had much luck propagating geraniums either (except for the annual kinds). I wish I could, it would sure save me a lot of $$$! Rose: Thanks for stopping by! I will definitely look up that Fothergilla, it looks so beautiful. Hope you daughter is enjoying her time in Portland...it is a great city! Racquel: I agree...'Black & Blue' is a true winner, I would be lost without it...so would the hummingbirds! Dreamybee: Thanks! I totally have to try the beer thing, I've always meant to, but since my garden is a steep slope, I can never get the platters to sit level! I love that persicaria. I've never seen that. What a lovely corner lot you have! Really enjoyed your post Scott ~ both those salvias are going on my wish list - such glorious colours !